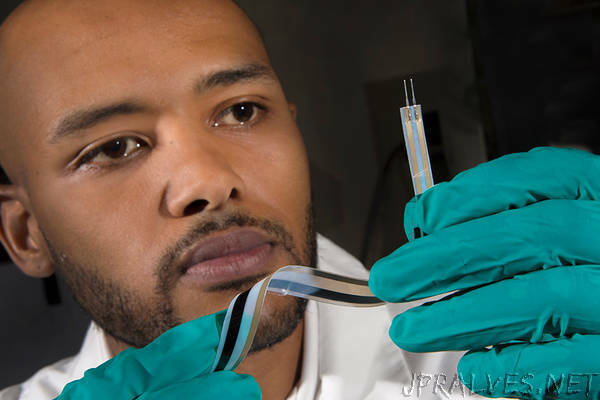 “Researchers from the FAMU-FSU College of Engineering have developed a class of breakthrough motion sensors that could herald a near future of ubiquitous, fully integrated and affordable wearable technology. In a paper published in the journal Materials and Design, engineers from FSU’s High-Performance Materials Institute, in collaboration with scientists from Institut National des Sciences Appliquées in Lyon, France, detail the impressive properties and cost-effective manufacturing process of an advanced series of motion sensors made using buckypaper — razor thin, flexible sheets of pure, exceptionally durable carbon nanotubes. These new buckypaper sensors represent a marked improvement on current industry standards, with most sensors being either too crude or too inflexible to reliably monitor complex structures like the human body. At this stage, potential applications for the printable buckypaper sensors are limited only by the breadth of researchers’ imaginations. The low-profile design could be integrated into bedsheets to monitor quality of sleep, shoes to track step count and posture or workout clothes to measure intensity of exercise. Researchers also foresee potential applications beyond the realm of wearable technology. In the field of soft robotics, the material could facilitate advances in the production of responsive, self-correcting artificial muscles. Moreover, the scalable sensors represent another step toward the long-predicted future of an “internet of things,” where virtually all of an individual’s computers, devices, garments, furniture and appliances are digitally connected to freely exchange information in the cloud. The novel sensor structure combines a strip of seven micron-thin buckypaper with silver ink electrodes printed from a common, commercially available ink-jet printer. The result is a kind of perfect Goldilocks sensor: not as insensitive as common, flexible metallic sensors, but not as rigid or cumbersome as popular, more sensitive semi-conductor sensors. The wearable buckypaper sensors are an ideal marriage of these competing qualities. They’re flexible, seamless and sensitive to subtle movements and strains. As development of the printable sensor technology continues, researchers hope to improve upon the already remarkable thinness of the material so that it can be integrated into comfortable and non restrictive clothing. Additional testing on complex model structures is required to ensure the material’s ability to conform to the variable curves and crevices of the human body. While the technology might not be ready for primetime quite yet, researchers are energized by its promising future.